We have assembled lots of useful links to information that may be helpful in planning travel to the Virgin Islands including transportation and accommodations to consider for before and after your VI Caribbean yacht charter itinerary. Scroll down to explore and link to the information. Fly BVI ~ VIP Service air charter company of the BVI Convenient and Reliable 800-621-7855. Caribbean Wings ~ Virgin Islands Charter flights. Liat ~ Commercial airline flying throughout the Caribbean islands. Seaborn Airlines ~ inter island sea plane. Speedys ~ Spanish Town, Virgin Gorda (284) 495-5240 or (284) 495-6154. Villa Blanca Hotel ~ Family run hotel nestled within 3 private landscaped acres of Virgin Islands’ flora and fauna, this moderately priced 14 unit hotel offers guests a quiet, peaceful, and intimate vacation with a spectacular panaramic view of St. Thomas Harbor and surrounding hillsides. Villa Santana ~ Quaint family run small hotel is a restored historic villa built in the 1850s by General Antonio Lopez de Santa Anna during his third exile from Mexico. Exceptional views of Charlotte Amalie and the harbor and only steps down to the shopping district. Bolongo Bay Beach Club ~ The small intimate beachfront resort with big resort facilities. Located on the calmer Caribbean side of the island of St. Thomas. Only 10 minutes from world class shopping, but nestled in beautiful country side. Offering a choice of value-packed Semi-Inclusive Continental and an All-inclusive Plan. Crystal Palace Bed & Breakfast ~ Enjoy breakfast while surveying the daily arrival of the cruise ships, or sip a cocktail from the honor bar as the sunset casts a rosy glow on the old town of Charlotte Amalie. The Crystal Palace is located in Dronningens Quarter in the heart of St. Thomas’ Historic district. The Green Iguana ~ A boutique hotel that offers charm wrapped around a realistic room rate. Only a five minute walk to Charlotte Amalie. Sapphire Beach Resort and Marina ~ Situated right on the beach, with all the amenities you could ask for and gorgeous views to St. John, Sapphire is a great place for all your vacation fun. A beautiful place for your wedding as well. Marriott Frenchman’s Reef and Morning Star Beach Resort ~ Oceanside resort with cliff-face and beach pools. Occupying a peninsula between Charlotte Amalie harbor and the sea, this resort features clifftop views and a half-mile beach. The Ritz-Carlton, St. Thomas ~ Italian villa-style resort with two long beaches. Secluded on the far eastern tip of St. Thomas and arrayed on a hillside above a deep bay, this resort features two long beaches, two large freeform pools, beachfront bars and restaurants, and a marble-lined health-and-beauty spa. Guestrooms include high-speed Internet access through 27-inch televisions, Nintendo, and CD and DVD players. Wyndham Sugar Bay Resort & Spa ~ Family beach resort featuring 10,000-square-foot spa Perched on a eastern-shore hilltop above Sugar Bay, this resort offers families active holidays and couples rest and romance. An expansive three-section pool, an Art Deco nightclub, a roomy fitness center, and a health-and-beauty spa. Guestrooms feature balconies and large bathrooms. Ceiling fans and air conditioning provide cooling options. Choose from an All Inclusive Plan or a European Plan (no meals). Holiday Inn St Thomas ~ Placed in the center of the action at a waterfront location in the middle of downtown overlooking Charlotte Amalie’s picture postcard perfect harbor. Nightlife and shopping within an easy walk. Secret Harbour Beach Resort ~ Small, casual all-suites resort with private beach on a bay a half-mile from Red Hook in East End St. Thomas, this resort features a quiet beach, a hillside pool, and a sunset-view restaurant. Antilles Point Pleasant Resort ~ Fifteen acres of tropical greenery create a secluded setting at this resort overlooking the Caribbean Sea. Large, airy suites with ocean- or garden-view balconies are distributed among villa-style buildings on the hillside. A nature trail winds down to a pristine, secluded beach. The hotel provides complimentary snorkeling gear and scuba instruction. Best Western Carib Beach ~ A Cardow Resort. Value and location is what you will find here. This resort is a great place for overnights, business trips, and leisure stays at the most affordable price. Best Western Emerald Beach Resort~ Small resort on calm-water Caribbean Sea beach with a good-size pool terraced just above the beach, and water-sport rentals. This 90-room resort lies on a semi-circular bay 0.8 miles from the airport terminal and 2 miles from downtown Charlotte Amalie. Bluebeard’s Beach Club ~ Set on 24 acres of secluded beachfront yet only 10 minutes from Charlotte Amalie’s duty-free shops, intriguing historic sites, and marina. A free-form pool, bar and tennis courts. Bluebeards Castle ~ A dramatic stone watchtower from the 1600s is the focal point of this romantic hotel, which overlooks the harbor and the historic port town of Charlotte Amalie on the southern coast of St Thomas. Elysian Beach Resort ~ On the eastern end of St. Thomas, this beachfront resort next to the St. Thomas Yacht Club on lovely Cowpet Bay overlooks its own yacht-filled cove and features comfortable accommodations, soft sands, sparkling surf, and a flurry of water sports for a classic Caribbean vacation. Village Cay Resort Marina/Hotel ~ In convenient Road Town, Tortola. A small luxury hotel and 106 slip full service resort marina, a poolside bar, and a waterside restaurant. Rates range from $115 – $350 plus tax and service fee. Maria’s By The Sea Hotel ~ Conveniently located in the heart of Road Town, along the shore of Road Harbor, within walking distance of most shops and offices, but somewhat isolated from the main traffic. Rates range from $110 – $170 plus tax and service fee. The Villas of Fort Recovery Beach Resort ~ On the calm and cool South West Caribbean side of the island with excellent swimming and snorkeling from a small private beach. Rates range from $165 – $430 plus tax and service fee. Sebastian’s On The Beach Hotel & Restaurant ~ Located on a gorgeous white sand beach in Little Apple Bay on Tortola’s North Shore. Charming 26 room hotel offers breathtaking scenery and total relaxation. Rates range from $85 – $230 plus tax and service fee. Myett’s Garden and Grille ~ Hotel and restaurant nestled among lush tropical foliage located on the beach at Cane Garden Bay, North side of Tortola. Rates range from $100 – $185 plus tax and service fee. Ole Works Inn ~ Another Cane Garden Bay favorite with a new small swimming pool and the best island music at Quito’s Gazebo. Rates range from $80 – $105 plus tax and service fee. The Lighthouse Villas ~ Open and airy villas on Cane Garden Bay with spectacular westerly vistas and a 2 minute walk from water’s edge.See rates on web site. The Tamarind Club ~ An intimate hotel which features a restaurant, bar/lounge and pool with swim-up bar. A quiet holiday hotel with a reputation for gourmet food and good times in a serene setting on Torotola’s North side by Josiahs Bay. Rates range from $90 – $160 plus tax and service fee. The Sugar Mill Hotel ~ Set in a lush tropical garden and just steps from the sea, the Sugar Mill is the perfect place to relax and enjoy the unspoiled beauty of the British Virgin Islands. Rates range from $180 – $310 plus tax and service fee. Cruising Guide Publications ~ Caribbean cruising guides. A must for bareboating. Bluewater Books and Charts ~ Nautical charts, books, electronic charts and much more! 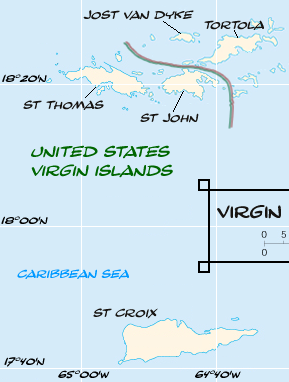 Virgin Islands Adventure Guide Comprehensive coverage of both the US and British Virgin Islands. Intriguing historical, ecological, and cultural facts bring the islands and their residents to life. Extensive coverage of the islands’ protected natural areas both on land and underwater. Color photos.